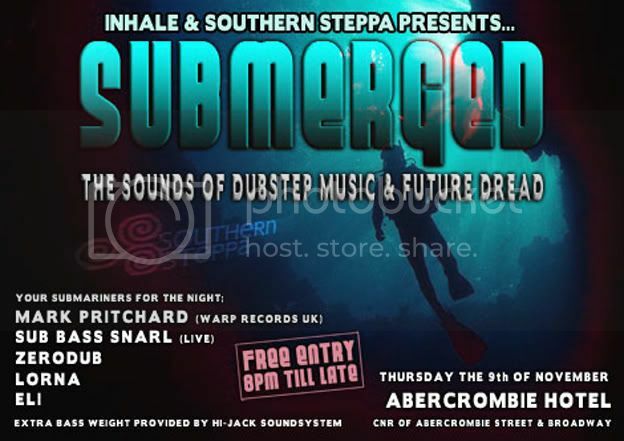 Monthly dubstep night Submerged takes place at the Abercrombie Hotel from 8pm. It is totally free entry and this month features sets from ex-pat Mark Pritchard (Global Communications, Jedi Knights, Troubleman etc), Lorna, Eli, Zerodub and even Sub Bass Snarl (yep, another set - 1030pm for us). Eli spends all his budget on ensuring there is a most enormous and most stomach turning bass heavy PA possible in the venue so you can rest assured that you will be hearing dubstep the way it supposed be heard.